Light Butcher Block Assembly Required 14 Body. Made of MDF Side Walls and Playfield. Regulation Size 55 x 29 x 34. Weatherproof table for both indoor and outdoor use in all weather conditions. 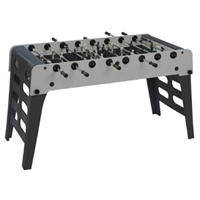 This outdoor foosball table is meant for those who require a technically advanced product but do not wish to compromise on aesthetics. The G-2000 Weatherproof combines weather-proof features – such as marine plywood, special anti-rust steels and waterproof glues – to the smart line of the correspondent indoor model. The interesting color effect of the cabinet, which is partly blue and partly grey, is reproduced in the legs and the leg cross-piece, whose arched style remarkably increases the table sleek look. The table colors will be protected by the waterproof cover, while the leg levelers (both accessories come as a standard) will allow its use on rough grounds. Recommended for pool decks, gardens, playgrounds, beaches, camping-sites, fun-fairs and other outdoor areas. This table can also be used indoor, to enjoy it all seasons. 1 1/4" cabinet, marine quality multi-layer plywood coated with plastic laminate, both water-resistant and brought together using a special water-proof glue for perfect sealing. Green playing field is plastic laminate glued using special water-proof glues. The silkscreened white lines are printed using a special ink that does not fade under the sun nor is damaged by dampness. 19 mm thick weatherproof cabinet constructed using an innovative compound of high-tech plastic materials reinforced with fiberglass for outstanding sturdiness. 10mm thick legs in the same material as the cabinet. The legs easily fold under the table by operating two handles. The leg panels, whose fretwork gives the whole an effect of great lightness, enhance the table stability. Playfield in water-resistant plastic laminate with white lines silkscreen printed on a green background using special inks that do neither suffer humidity nor fade under the sun. Bolts, nuts and screws with tropical anti-rust treatment. 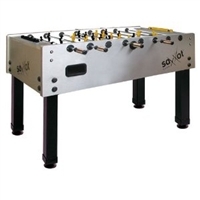 The G-500 is most popular Garlando foosball table. 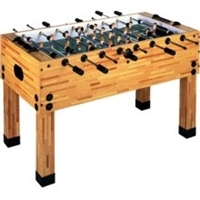 A classic looking elegant foosball table whose quiet appearance will fit in any room like a piece of furniture. The perfect mix of assets, achieved without compromising on quality and components: strong construction, excellent stability and outstanding playability make this the top selling table. 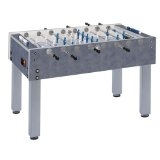 The G-500 is most popular Garlando foosball table. The Evolution is the newest edition to the Garlando line of foosball tables. The G-500 has the perfect mix of assets, achieved without compromising on quality and components: strong construction, excellent stability and outstanding playability make this the top selling table. 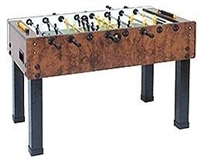 The G-500 is most popular Garlando foosball table. The Pure-White is the newest edition to the Garlando line of foosball tables. The G-500 has the perfect mix of assets, achieved without compromising on quality and components: strong construction, excellent stability and outstanding playability make this the top selling table. 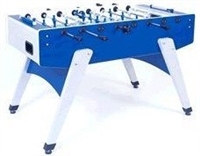 The Evolution G-2000 foosball table is the newest edition to the Garlando line of foosball tables. The G-2000 immediately strikes everybody’s attention for the particular shape of its cabinet, looking like a gondola, and for the inclined legs whose arch-cut cross-panel conveys a soaring and elegant impression. The G-2000 is in all respects a professional table, also available in blue as an outdoor table.